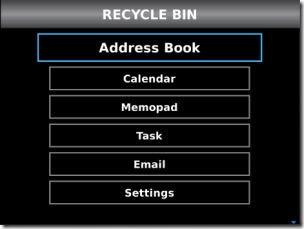 Restore Your Email and Contact Its been erased - Have you ever delete emails, contacts or memopad from your BlackBerry, when you remove it is something important, and when you look back emails or contacts or important memopad realized it turns out you have been erased. To avoid foolish things that happens you can use the help of a free application that is extremely useful. His name Application Recycle Bin. This application functions as a PC / Laptop, that is if we delete a file, the file is actually not really deleted but still stored in the recycle bin that we can still restore back. 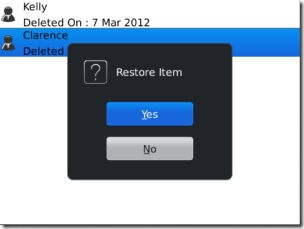 The files can be restored back is email, contacts, tasks, memos and calender. You have finished reading Restore Your Email and Contact Its been Erased and many articles about Tech Gallery in our blog this, please read it. and url link of this article is https://littlebitjohnny.blogspot.com/2013/02/restore-your-email-and-contact-its-been.html Hopefully discussion articles on provide more knowledge about the world of new tech gadgets.